HEY ALL, JUST GOT THESE PICS IN, ENJOY! THANK YOU SO MUCH TO EVERYONE WHO MADE IT OUT LAST NIGHT! 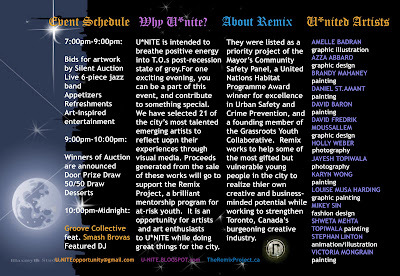 WE HAD A GREAT TURNOUT, SPECIAL THANKS TO ALL THE ARTISTS WHO DONATED PIECES, STEPHAN LINTON AND DAVID MOUSSALLEM FOR THEIR PROMO ART, KARYN WONG FOR CURATING AND SETUP, KEVIN TREFFINGER AND THE SMASH BROVAS, GROOVE COLLECTIVE, ROB - FOR LIGHTING AND SOUND, AGI FELVIDECKI FOR SETUP AND SUPPORT, MICHAEL CERASANI FOR PHOTOGRAPHING THE EVENT, AMANDA MILAKOVIC FOR HER BEAUTIFUL CANDLE SET DONATION, TERI SEEGERS FOR HER DELICIOUS HAND-MADE CHOCOLATE DONATION, THE REMIX STAFF FOR THEIR PRESENCE AND SUPPORT, AND OF COURSE PREMIUM RHYTHM LOUNGE. LOOKING FORWARD TO THE NEXT EVENT, HOPE YOU GUYS WILL JOIN US AGAIN! Many Thanks to David Moussallem (www.davidfredrik.com) for this wicked poster! Many Thanks to Stephan Linton (BlaxmythStudios.deviantart.com) for this awesome flyer design! Born and raised in Canada, he has played guitar for seventeen years specializing in improv. Kevin hopes to inspire up-and-coming artists by bringing a positive influence to the music culture in Canada. 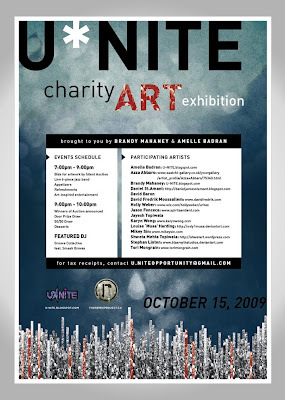 This blog is for any who would like to participate in an upcoming art exhibition this fall. Those of you artists, and art enthusiasts who are frustrated with your jobs, needing both an outlet for your ideas and the exposure to implement them on a broader scale, this show may be for you. 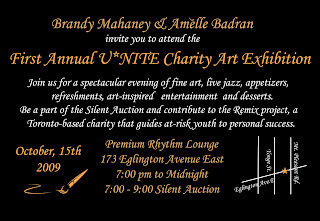 The proceeds of art sales will go to support a Toronto-based charity called The Remix Project http://www.youtube.com/watch?v=J3QKHr6AAvw so you won't be financially compensated. HOWEVER... there will be a very strong media presence there so the opportunity for this kind of exposure is of the once in a lifetime variety, not forgetting the most important thing: you will be contributing to something meaningful. The Toronto art scene is so restricitve; this is a chance for emerging artists to do something positive by helping the community, and get some recognition for their talent.